An overlooked potboiler mob story that promises good old-fashioned cinema action and entertainment. 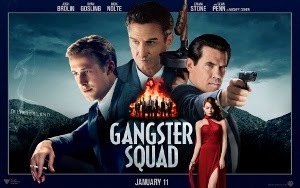 Of all the movies deemed underrated in 2013, Gangster Squad is one of the top ones that most likely suffered from poor marketing and promotion (also given a poor release date in January 2013, after the end of the holiday box office releases). This action crime drama has an Untouchables-esque feel to it (but not on the level of that film), as well as a noir theme similar to the mob films of the 1940s. The action, the twists, and pace of the film make it feel like an old Saturday matinee, where the good guys shoot up and stop the bad guys. In 1949, gangster Mickey Cohen (Sean Penn), sets his eye on controlling all organized crime in Los Angeles. He’s willing to take any means necessary to do so. With local judges and police all paid off and in his pocket, he has no one to stand up to him. No one except hardened L.A.P.D. Detective John “Sarge” O’Mara (Josh Brolin). After rescuing a woman from being raped and brought into Cohen’s prostitution ring, he attracts the attention of Police Chief Bill Parker (Nick Nolte). Parker recruits him to head up a secret L.A.P.D. operation that will, without uniform or badges, bring Cohen’s operations in L.A. to a collapse. With the help of O’Mara’s pregnant wife (Mireille Enos), he assembles a small squad of seemingly unlikely and unorthodox members (due to work styles, personal attitudes,and the racial attitudes of the 1940s), including O’Mara’s lazy and complacent partner Sergeant Jerry Wooters (Ryan Gosling). Each member has their specialties, including one who is an expert in knives (Anthony Mackie) and a veteran officer (Robert Patrick) who brings a cowboy persona to his gunslinging-style of shooting down mobsters. The team takes on L.A.’s biggest mobster head-on, with no badges, no mercy, and no laws holding them back. 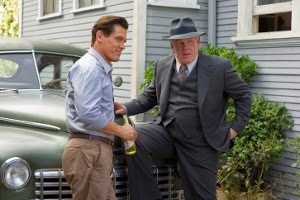 Brolin’s performance as a hardened, tough as nails police detective and former US Army OSS operative is fantastic. Sean Penn nails down the stereotypical New York mob persona as Cohen. Giovanni Ribisi delivers a good performance as the Gangster Squad’s family man and wiretapping and communications expert. Emma Stone radiates beauty as the love interest of both Ryan Gosling’s and (partly) of Sean Penn’s characters. Gangster Squad is loosely based on the L.A.P.D.’s actual secret operation, with officers and detectives called the “Gangster Squad unit” who battled Mickey Cohen and his crime operations in the 1940s and early 1950s. However, after watching the film, further research will tell you how the actual characters turned out. Note: One historical tidbit from this film: Police Chief Parker’s driver is a young officer by the name of Daryl Gates (Josh Pence). Gates will later rise through the ranks of the L.A.P.D. and become its chief, who’s career will be permanently tarnished and damaged amidst the 1991 beating of motorist Rodney King and the L.A. riots the following year. The production design for Gangster Squad, including the sets, wardrobe, vehicles, and color tone, really brings 1949 Los Angeles alive for the viewer. The soundtrack includes old standards like “Route 66” and “Bless You (For the Good that’s In You)” by Peggy Lee and Mel Torme. The combination brings this world of 1949 to life. It can also be said that it’s like a graphic novel brought to life in living color and sound. Though it does not hold a candle to Brian De Palma’s The Untouchables, Gangster Squad is a must-see and was not given the chance it deserved in its original release.